foreign tourists. 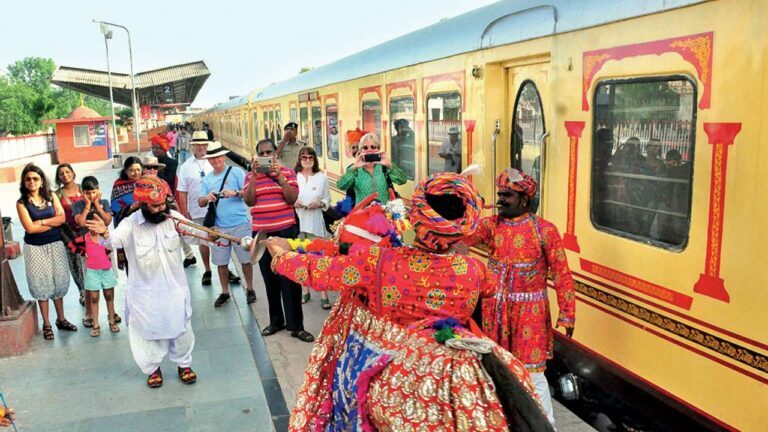 Palace on Wheels is one of the major factor that has increased the tourism in Rajasthan. Palace on Wheels has graced Indian railways since 26th January, 1982 when it made its inaugural operations from October 1982. It initially comprised of saloons that were used by the royalties of India.Palace on Wheels has been rated as one of the best ten luxurious rail journeys in the world. It offers you a heart-rending trip to the splendid forts and palaces of Rajasthan in just seven days. Also discover the royal history of Taj Mahal in Agra. The journey to the hinterland of the desert starts every Wednesday evening at 1800 hrs from Delhi and ends on the following Wednesday early in the morning at 0730 hrs.Palace on Wheels has gained remarkable success and attained world wide acclaim including the PATA gold award in 1987. Discover the rich heritage of the magnificent cities on your voyage in Palace on Wheel. Special Attraction : Camel Safari, Cultural Programmes. Delhi :The Capital City of India. This is will be the first stop on your Golden triangle tour. Jaipur : Also known as the Pink city of Rajasthan, Jaipur cajoles tourists . Agra : The third and the last stop is known for housing the World Heritage Site - Taj Mahal. A visit to Chandni Chowk. Yes! offcourse - The Taj Mahal, a World Heritage Site.